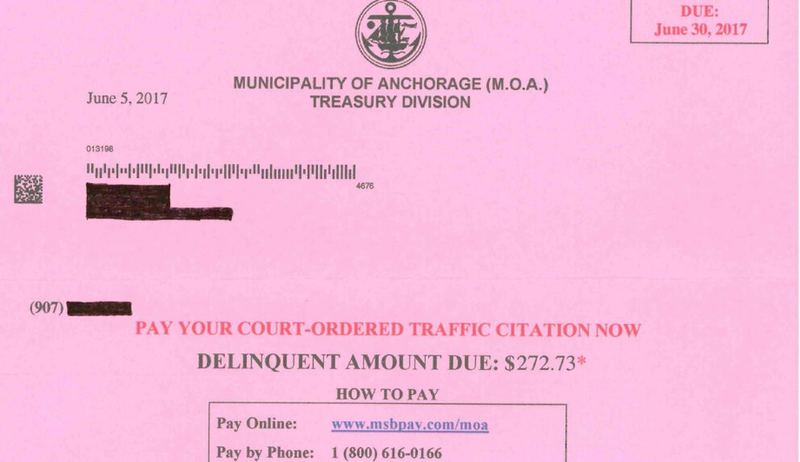 In early June, Anchorage's treasury office mailed out a letter that did its best to catch the reader's attention. "You really need to open this," the envelope read. Inside, the letter warned of an overdue payment on a $272.73 traffic ticket for tinted windows. As well as spelling out the consequences of not paying, the letter gave the reader the option of a payment plan. One of a few thousand similar notices mailed out that week, the letter was a test in encouraging people to pay fines — a departure from the nondescript, text-heavy collections letter city treasurers had been sending out for years. It was also an early sign of what may be coming from Anchorage's nascent "innovation office," funded by a three-year, $1.5 million grant from Bloomberg Philanthropies, the foundation created by the billionaire former New York City mayor Michael Bloomberg. After a Bloomberg-run workshop in April, city treasurers decided to change the format of the letter used to collect delinquent fines. The idea was to make it more eye-catching and easier to read and understand, said city treasurer Dan Moore. So far, the new letter is netting the city hundreds of thousands of dollars more than usual in fine payments, according to Moore. His office has projected a total revenue boost of nearly $1 million in 2017 compared to last year. Anchorage's innovation team plans to focus on employment, health care costs and some of the city's more complex problems in the coming years. But "side projects" like the treasury letter will likely also be part of the mix, said Brendan Babb, who was hired by Mayor Ethan Berkowitz to be the city's first chief innovation officer more than a year ago. The Bloomberg grant has allowed the city to hire Sioux-z Humphrey Marshall, an entrepreneur who previously worked as the chief financial officer at the Alaska Travel Industry Association, and Patrick McDonnell, an urban planner who most recently worked for the city of Austin's innovation office in Texas. Along with Babb, Marshall and McDonnell are working in a brightly painted room behind an old bank office in City Hall, which is also paid for by Bloomberg. On one wall, maps detail census information and other data about the Mountain View neighborhood. In the coming months, the innovation team, or "i-team," wants to help people earn money, either through training or getting a job, in the neighborhoods of Muldoon, Mountain View and Spenard. Babb said the other goal will be reducing the cost of living. He said the team also plans to examine cutting health care costs for the city, one of the biggest items in the city budget. "A lot of what cities solve is symptoms, putting out fires, or providing services," Babb said. "Bloomberg's goal is to bring in different techniques and models for solving problems." In the case of the treasury letter, the problem was that people were not paying fines. The city is owed tens of millions of dollars, mostly in criminal fines. Moore's department is in charge of encouraging people to pay up. In the past decade, the city has collected $50 million in fines and traffic tickets. But about that same amount is still unpaid, Moore said. During the Bloomberg workshop in April, attendees split into several teams to look at the city's standard collection letter. The letter meant the person had already missed the payment deadline and the case had been referred to a collections agency. The original envelope was nondescript, carrying just the treasury division's address. The letter inside was text-heavy and black-and-white. The version produced by the workshop was more colorful, eye-catching and easy to read, Moore said. It also included a new section under the words "Trouble paying?" In the old letters, there was no mention of a payment plan, and people often stumbled across it in phone calls to the collection agency, Moore said. "In this case, they got it in the mailbox, a letter that said, black and white, 'There is an option that might fit your situation,' " Moore said. It has proven highly effective, according to Moore. Traffic tickets average $150, and criminal fines tend to be several times that. When the treasury sent out about 5,000 of the test letters in June to randomly selected debtors, "many hundreds" of those people signed up for payment plans for the first time, Moore said. Most of the fines will be paid off in six months, leading to more fine money collected overall, Babb said. Babb said he considered it an early victory for Anchorage's innovation team, and a sign of the direction he and his colleagues hope to move the city. "Some things, people hadn't thought to change them," Babb said.